For those who suffer from arthritic problems of the hands, life can be a real struggle. Everyday tasks become everyday challenges: everything from turning knobs to opening jars to fastening buttons...and everything else that you do with your hands...is a painful, difficult problem. It is easy for those of us who don't have this struggle to take these things for granted. There is a product on the marketplace that can help someone with the pain and swelling that they may be experiencing from arthritis in the hands. The purpose of this product is to provide mild compression, helping to relieve pain and swelling to all those bony joints! 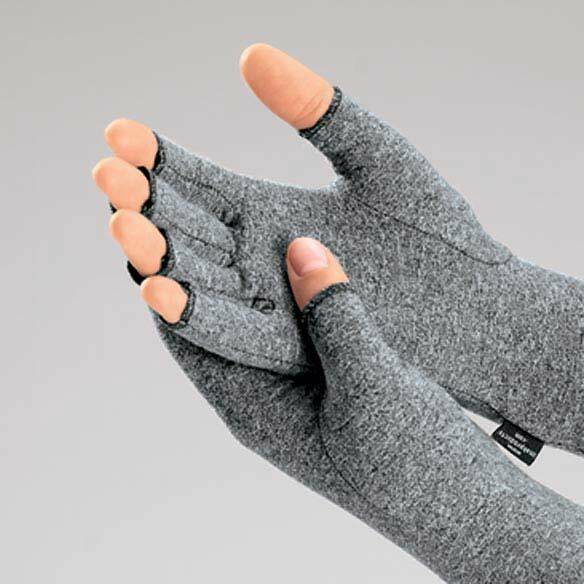 Thus I bring you to today's non drug pain management idea: compression gloves. These are pretty easy to find on the Internet if you are interested in purchasing a pair. Medical supply stores may also be able to assist with this.